The GLO Premier League 2010-2011 finished in early June and there is already hundreds of transfer speculation surrounding some of the best players in the country. In this post, I have gathered some of the rumors, as well as some confirmed transfers. Please note that Ghanaian media often writes about rumors as if a transfer has taken place, so this post should be read with some skepticism. * Medeama SC is apparently interested in signing Stephen Adams (born 28.09.1984), the brilliant goalkeeper of Aduana Stars FC. The source is Ghanasoccernet. 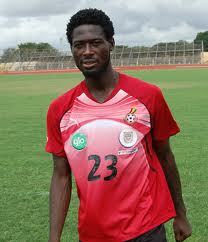 * Sampson Cudjoe (born 22.06.1988) was left AshantiGold SC and joined the ambitious Medeama SC. Cudjoe is a strong defensive midfielder or central defender and in my opinion, this is a wonderful signing for Medeama SC. The picture is of Cudjoe, and is taken from Ghanasoccernet. * There are rumors in Ghana suggesting that Alex Asamoah (born 16.01.1986), the powerful striker of Asante Kotoko FC, will play for AshantiGold SC next season. Goalkeeper Fatau Dauda (born 06.04.1985) will apparently go the other way and challenge Isaac Amoako (born 20.08.1983) at Kotoko. * According to fresh reports from GhanaWeb, usually a reliable source, Asante Kotoko FC are about to finish the transfer of Bernard Don-Bortey (born 22.09.1982) from Aduana Stars FC. The experienced playmaker has about 10 full international matches for the Ghana national football team. * Daniel Nii Adjei (born 29.09.1988), the consistent midfielder of Asante Kotoko FC that was almost ever present this season, scoring 6 league goals, will apparently join Maccabi Haifa from Israel during the Summer. * Francis Coffie (born 16.08.1988), the former left-winger of Asante Kotoko FC, will apparently play for Medeama SC in 2011-2012. * Central defender Mohammed Awal (born 01.05.1988) and midfielder Michael Akuffo (born 18.12.1985), both key players for Asante Kotoko FC, are travelling to Europe for trials at Dinamo Zagreb of Croatia. * Modernghana reports that left-winger / attacking midfielder Douglas Nkrumah (born 28.11.1986), the top scorer of Hearts of Oak SC with 12 league goals this season, will be travelling to South Korea for trials with Pohang Steelers, Chunnam Dragons and Busan I’Park. Asante Kotoko FC is also interested in Nkrumah, as well as the young prodigy Uriah Asante (born 06.03.1992). If Kotoko signs these players from rivals Hearts of Oak SC, eyebrows will be raised in Ghana. * Obed Ansah (born 02.11.1986), the attacking midfielder of Hearts of Oak SC, will apparently undergo trials for Bloemfontein Celtic FC, a South African top division side. * Burly striker Emmanuel Clottey (born 30.08.1987), the top scorer of Berekum Chelsea FC, have been attending trials at Polonia Warszawa from the Polish top division. * Clottey will almost certainly leave Chelsea and the replacement is already brought to the club. Nana Poku (born 01.09.1988), the star striker of city rivals Berekum Arsenal FC, has joined the champions. Poku scored 16 goals for the struggling Arsenals this season and should be able to fill the shoes of Clottey if he gets another European adventure. * Gladson Awako (born 31.12.1990), the highly gifted central midfielder of Heart of Lions FC, has joined Berekum Chelsea FC. This transfers is confirmed. * A player called Isaac Morgan played for Berekum Chelsea FC in the Presidents Cup yesterday. This is most likely the former Heart of Lions FC midfielder Isaac Morgan. If this transfer has actually taken place, it will be a major boost for AshantiGold SC. * According to unconfirmed reports, Asante Kotoko FC are interested in Augustine Okrah (born 18.09.1993), a young midfielder from the Red Bull Academy. * Asante Kotoko FC is also apparently considering Mark Adu Amofah (born 07.06.1987), a center forward who played a couple of matches for Liberty Professionals FC this season. Interestingly, both players are registered with the date of birth 04.07.1989. I have previously written about Fuseini Nuhu, and commented that there seems to be some confusion regarding the age of the players. Alhassan scored 2 goals for New Edubiase United FC, while Fuseini, who has played for the Ghana B national football team, scored 9 goals in the GLO Premier League 2010-2011. * The right-back and captain of relegated BA Stars FC, youngster Amos Frimpong, is apparently attending trials at FC Sheriff Tiraspol. If he does not succeed, top club Asante Kotoko FC is interested in the talented defender. * Ahmed Touré (born 17.07.1987), the impressive and lively Ivorian striker with 11 matches and 5 goals for Asante Kotoko FC this season, will almost certainly leave Kotoko this summer. He has been linked to FK Partizan from Belgrade, Serbia. * John Ashong (born 02.11.1981) and Henry Entsir (born 07.09.1990), the central defensive pair at AshantiGold SC, as well as striker Yakubu Mohammed (born 26.07.1990) are apparently on the radar of Kaizer Chiefs FC from South Africa. * Asante Kotoko FC is apparently following midfielders Alhaji Sani and Theophilus Anobaah, both from AshantiGold SC. * A few months ago, Hearts of Oak SC was following left-winger Prince Attakora Gyimah (born 25.12.1990) who played for BA Stars FC during the second part of the GLO Premier League 2010-2011. I expect the skillful youngster to stay in the GLO Premier League also next season. * Versatile defender Kweku Andoh has apparently joined champions Berekum Chelsea FC from Heart of Lions FC. Andoh had a wonderful season in 2010-2011 and the strong right-back / central defender should be a key member for Chelsea next season. * King Faisal Babes FC was disappointingly relegated from the GLO Premier League 2010-2011 and it is expected that several of their best players will leave the club. Their star defender Awudu Nafiu (born 02.12.1988) and top scorer Abdul Wahab (born 30.07.1989) have traveled to Tanzania and the ambitious side AZAM FC and as far as I can tell contracts have been signed. * Both Hearts of Oak SC and Asante Kotoko FC are hoping to sign Gilbert Fiamenyo (born 06.07.1992) from Heart of Lions FC. However, the talented striker is apparently on the radar of an unknown Turkish club and he has expressed that he would prefer to join a European club. * Godfred Rockson (born 20.10.1986), the central defender and captain of Heart of Lions FC has joined Bucaspor of Turkey. Bucaspor will be playing at second level of Turkish football in 2011-2011. Ghanaian media has also reported that Rockson would join Medeama SC but this seems to be incorrect. * Kabiru Imoro (born 05.06.1985), the striker of Medeama SC, has apparently joined Bucaspor together with Rockson, but apparently on a loan deal. Imoro scored five league goals in 2010-2011. * Jordan Opoku (born 08.10.1984), the attacking midfielder / winger of Asante Kotoko FC is apparently back in Ghana after his loan appearance at Dinamo Tirana from Albania. Opoku played 16 matches and scored one goal for the Albanian side. * I am surprised not to have read several rumors regarding Nathaniel Asamoah (born 22.02.1990), the star striker of Asante Kotoko FC. Foreign scouts should check out this player and this short clip shows some of his qualities: http://www.youtube.com/watch?v=g53bYyavM94.